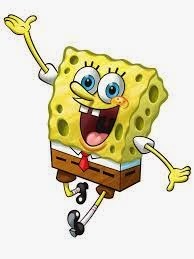 My two boys are SpongeBob SquarePants fanatics. They are maniacal about their obsession. The dinner table is often the preferred arena for reciting lines from their favorite episodes. 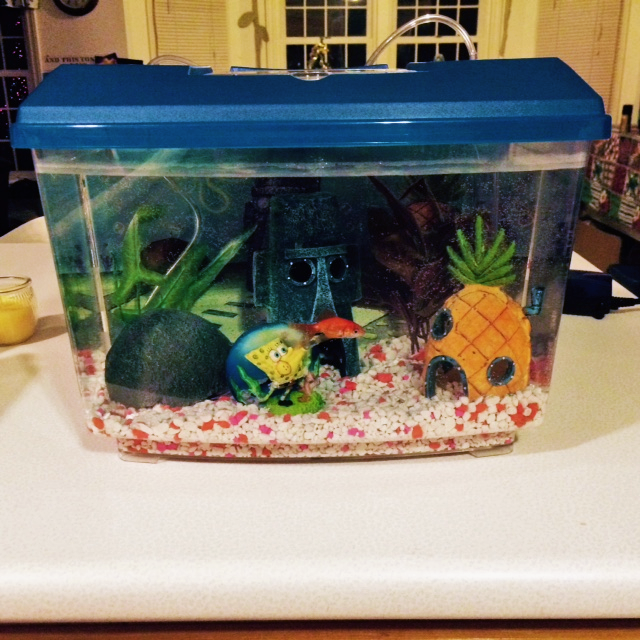 We had a blast setting up the "absorbent-and-yellow-and-porous is he, pineapple-under-the-sea" aquarium. It was very inexpensive and came with everything, except the fish. The boys loved it. It seemed to be, by far, one of my better finds for a cool and care-free Christmas present. Yes, dear readers, I am sorry to report, this ingenious idea may not have been such a clever one after all. Let me explain. 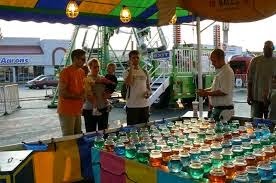 When I was a kid, I took a trip to our local fair and won a fish from successfully throwing a ping pong ball into a small goldfish bowl. You may remember the game? But the thrill of my victory was short-lived and poor Romeo was kept in his glass bowl where rarely, if ever, his water was changed. Despite a few failed attempts at "jumping-out-of-the-bowl" suicide, he was indestructible, living for many years, in stagnant and murky water. Perhaps it was the memory of that hardy, low-maintenance fish that made me believe an aquarium would be a more humane and easier environment to keep clean and display a few furless, finned friends. It appears that I am aquatically ignorant. With the introduction of our new aquarium, I have transformed into nothing short of a mad scientist. Who knew, there were things like ammonia, nitrates and chlorine levels that need checking. Who knew that cycling a fish tank is the first step in preventing what's called New Tank Syndrome, a toxic form of cloudy water that can kill a fish as fast as you can say "love that dirty water"! I have been doing my best to perform test samples of the water, checking the pH and ammonia levels. I have made frequent water changes. I have mixed unusual concoctions of powders, liquids and noxious chemicals. All of this to ensure a crystal clear environment that promotes the favorable well-being of our newest family member. My new lifestyle caring for this aquarium has become like a new mission in life for me, a lifelike microcosm and all-too-familiar representation of the role I play every day in caring for my children.